Luc Besson’s output has regularly varied from the sublime to the ridiculous and on one hand, that maverick style can be incredibly thrilling. On the other hand, it can lead to some rubbish films. ‘Valerian and the City of a Thousand Planets’ sits somewhere between the two viewpoints, and it’s probably closest in tone and style to ‘The Fifth Element’ from Besson’s filmography. The film has had a bit of a kicking in some quarters and it’s not entirely unwarranted as it makes its way through some clunky dialogue and a couple of weak performances, but I did find it very entertaining and a lot of fun. Put it this way, I was never bored through the close to 140 minute runtime, and I enjoyed the visuals and the world building of the universe where the film is set. The film takes place in the future in a gigantic space station comprising of the thousand planets of the title, where a variety of humans and other species live in relative harmony alongside one another. 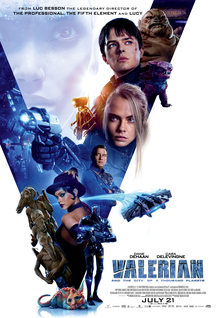 Our viewpoint into this world is through two special agents of the human police force, Valerian (Dane DeHaan) and Laureline (Cara Delevingne), who are tasked with retrieving a rare animal from a criminal gang by their superiors. This sets off a chain reaction as Valerian and Laureline start to find out why the animal is so highly sought after, and their investigations start to unravel a conspiracy about a destroyed planet that they naturally find themselves drawn into as they search for the truth. I thought it was pretty well plotted at the beginning, with enough mystery and curveballs thrown to hold my interest, before it became a little too conventional as we approached a fairly predictable conclusion. I felt that Dane DeHaan was badly miscast and he had no real chemistry with Cara Delevingne (who I thought was good), with the dialogue in their introduction about him being a ladies man coming across as particularly cringeworthy. The film fared better in the supporting stakes with Ethan Hawke having a great time in a brief cameo as a sleazy nightclub owner, and some of the species we meet were intriguing and funny. Clive Owen phones it in a bit as the head of the human police force, which was a little disappointing. ‘Valerian and the City of a Thousand Planets’ is not a great film by any stretch, but it is great fun, and it’s a strong reminder that not all science fiction needs to be deeply intelligent and thought provoking to grab your attention. I thought this was a blast for the most part, and despite its many flaws, I did really enjoy watching it.